I know the name of this recipe is pretty hilarious, but recently I joined an online barbecue forum, and everyone was talking about the ‘fatty’. I can see why they call it that, most likely due to all of the bacon, and pork, but trust me on this one, this thing is nothing but awesome. 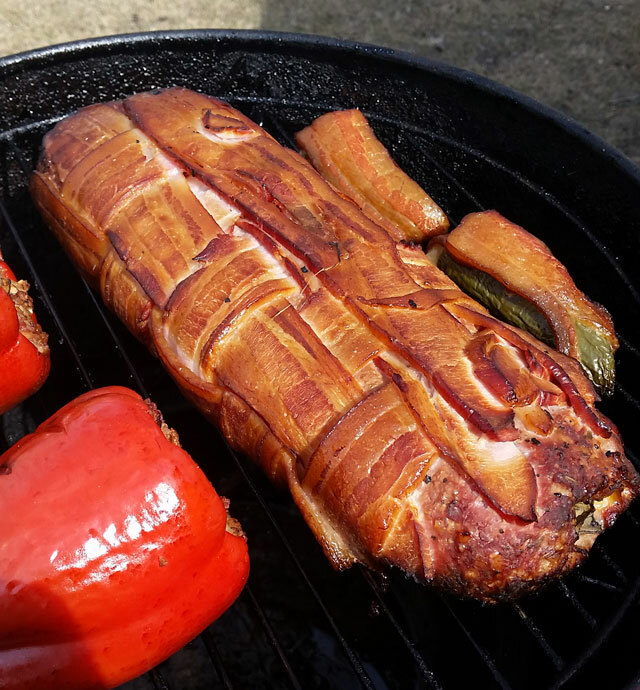 There are a few great things about making this, as one you get to make a bacon weave, lay out some great ground pork, and stuff the pork with whatever you have in mind, then roll it up, and place it on the smoker. I got really excited when making this, and the end result was something my entire family loved. Now let me start by saying you can stuff this however you want. 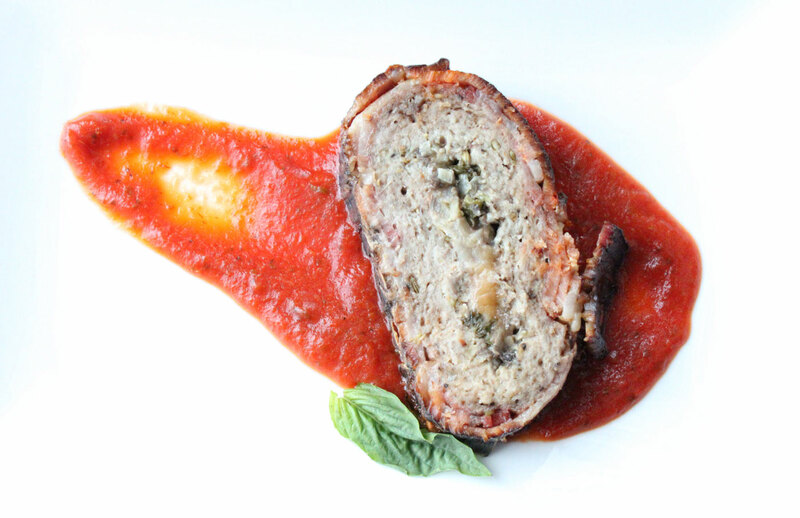 I went more of an Italian style stuffing because I wanted to finish the bacon wrapped fatty with pizza sauce rather than barbecue sauce, but take the general layout here and make it your own. Start by making your bacon weave. I will not go over those details, but it only takes a few minutes. There are many online instructions how to make one. One resource is this one, on YouTube. 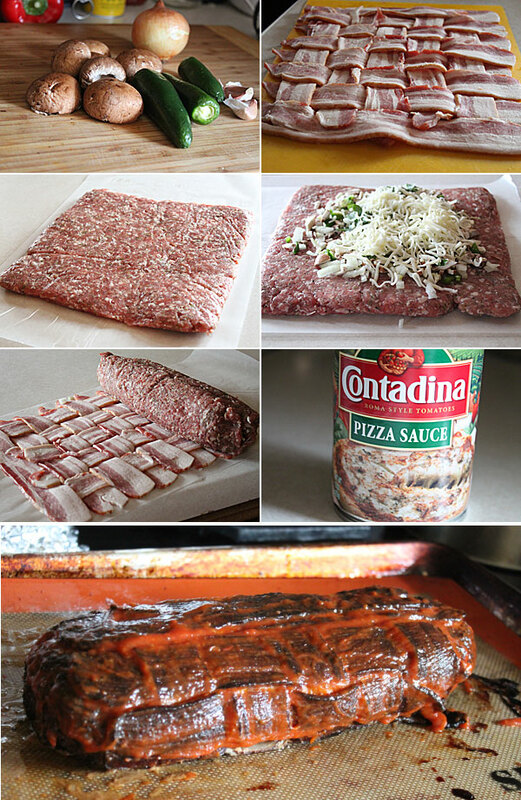 Once the bacon weave is made, lay it on a large sheet of wax paper. Next add the Italian sausage to a sealable plastic bag, and with a rolling pin, gently roll the sausage back and forth and side to side to level it out. Once the pork is nice and even, using a scissors, cut along side the edges of the bag. Carefully flip it over and onto the second piece of wax paper. Add the mushrooms, garlic, onion, cheese, and jalapenos to the top, center of the flattened sausage. Carefully start rolling the pork mixture into a log using the wax paper as your guide. Once you have it in log form, using your hands, seal up the edges, then add the log onto the top of the bacon. Repeat the process with the bacon. Now you have a bacon and pork log! Place this onto your smoker. It’s going to smoke for a few hours. I smoked it on low for about 3 hours, then finished in the oven after lathering some pizza sauce onto it. You want the internal temperature of the pork to be about 165. When you are ready to serve, slice into rounds, and serve with any of your favorite sides. The end result is a great smoky flavor, along with an exterior of crispy bacon, and an interior of super tender pork, melted cheese, and great vegetables. It was surprising, to say the least, how great this was. I had it as a sandwich the following day, and don’t even get me started on that one! If you are looking for a new item to put on your smoker, and one that will serve many, give this one a shot. Hope you enjoy! This is so darn good looking that I am sitting here at my c omputer , eating with my eyes until they burn ! This is definatley going to be on the TBE list for this week. You are so creative. Hi Katie – I have yet to do one whole in the oven, however I will be doing another one that way in the near future. I suspect you could put it in a elevated dish above a baking dish, at 350 so the bacon crisps and you get the internal temp the same as you would on the smoker. Good luck!